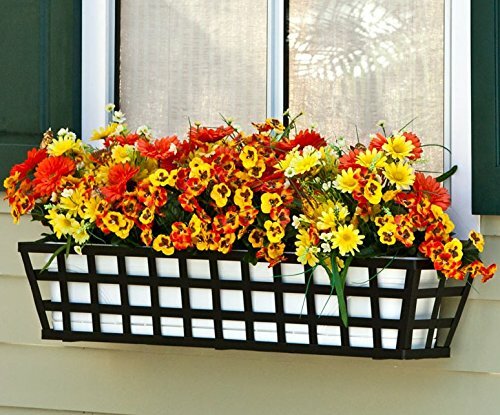 Our Santiago style of tapered wrought iron window boxes are a beautiful addition to any window, deck or patio. A metal strip runs along the back and features three holes through which screws can be drilled. Screws for installing are not included. You can even bypass the liner and insert small flower pots if you choose (6-8" pots will fit great). Each box features a textured black, powder-coated baked on finish that helps resist rust and the elements. A variety of brackets for all deck rail sizes are also available (sold separately).